In the 80s and 90s, Italian design house Bertone was dabbling with automobile sales: Think Bertone X1/9. In the 1990s they began dabbling in the off-road market, assembling bits from a couple of automakers to develop the “Bertone Freeclimber” small SUV, which they sold to eager Europeans. The Freeclimber is essentially a slightly modified first-generation Daihatsu Rugger (known also as the Rocky) with a choice of three BMW engines: a 2.4-liter turbodiesel, and a 2-liter or 2.7-liter gasoline option. The diesel, for obvious reasons, was the most popular selling version. The Freeclimber was significantly better equipped than the Rugger/Rocky upon which it was based, giving buyers standard power door locks and standard air conditioning. Buyers were given the choice of a soft top or a sunroof top like this one. In France, they offered a luxury version, known as the Blue Lagoon, though it’s quite rare. Bertone didn’t do much with the bodywork to differentiate it from the Daihatsu version, however, simply adding a second pair of headlamps to a unique grille panel. 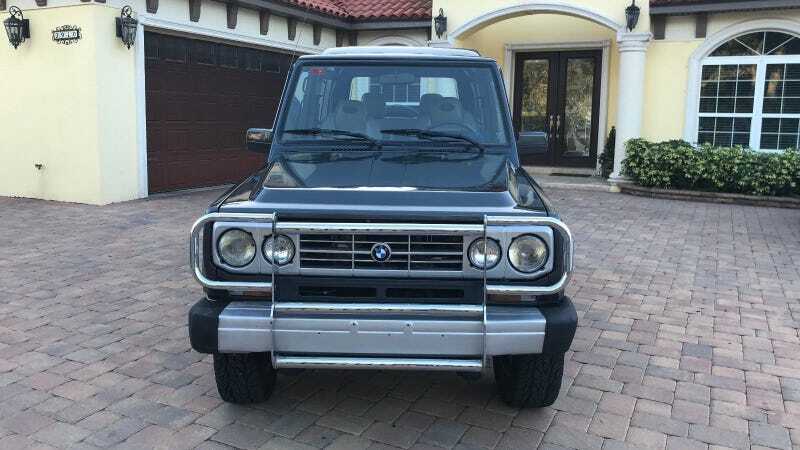 While the Freeclimber was never officially imported to the US market, this particular example is available on eBay with a claimed clear Florida title and about 39,000 miles. The car has functional four-wheel drive and a ‘smooth-shifting 5-speed’, so it’s got that going for it. That standard air conditioning, though, it doesn’t work anymore. Offered between 1989 and 1993, the BMW-powered off-road pseudo-Italian Japanese trucklet sold around 2800 units, making this a rare find. It’s even more rare to see one of these in the US. Hell, I only saw a couple Daihatsu Rockys this summer and both times I was surprised to see how clean they each were. If you’re the kind of hipster with a BMW E30, and you want to transition lifestyles to become one of those overlanding hipsters without a messy wardrobe change, this BMW-powered Bertone Freeclimber is rare enough that you can say “You’ve probably never heard of it”. Isn’t that worth its weight in hipster gold? If you’re Rad enough to step into Freeclimber ownership, this looks as good a place to start as any. You can find more photos and information about the car at this eBay listing. Hat tip to Obscure Cars for Sale!